German Area, Berlin 1948 to 1976 Collection, one hingeless album and one stockbook, noted mint #9N1-16 (signed), used set (not signed), mint 9N21-34 (GPS cert. ), used set signed, 9N35-41 mint and used, n.h. 9N61-63, then mint and used of most issues to 1976, stockbook noted 9N1-20 (signed), 9N33 used (signed), 9N21-34 (not signed), 9N61-63 n.h., used sets (3), 9N80-136 mint and used in multiples, mostly mint after this, Fine to Very Fine. 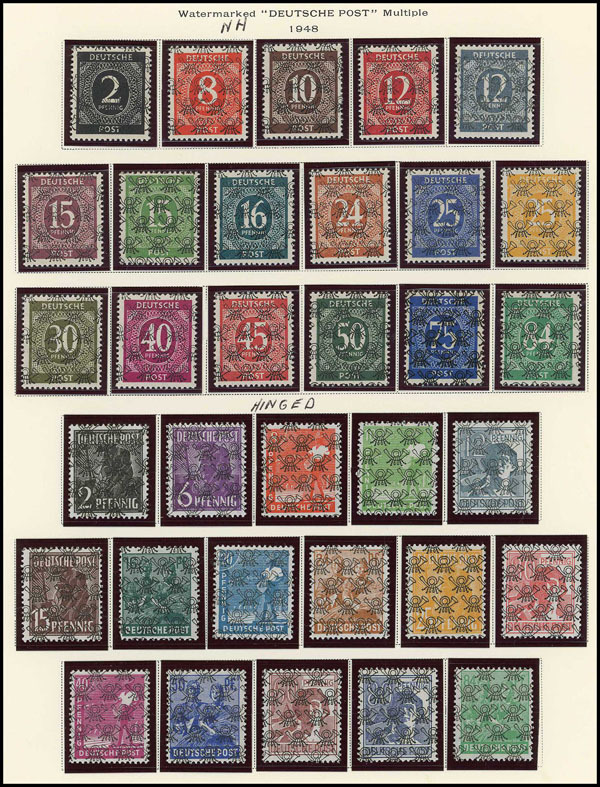 German Area, Colonies Accumulation, About 300 with duplication mostly o.g., with a nice group of 1m-5m issues, including German New Guinea #19, and Mariana Islands #29, plus few blocks, worth a close look, generally Fine to Very Fine. German Area, Collection in Scott Album, Few thousand from 1870 to 1974 few early used, balance mostly o.g. with some modern issues n.h., includes Empire, Third Reich, Occupations, and Berlin, including better Semi-postal issues, generally Fine to Very Fine. German Area, States and Occupations Collection, Few thousand mostly o.g. on Scott pages, strength in Danzig, Laibach, Saar, Slovakia, Serbia and smaller countries with a scattering of better States, Fine. 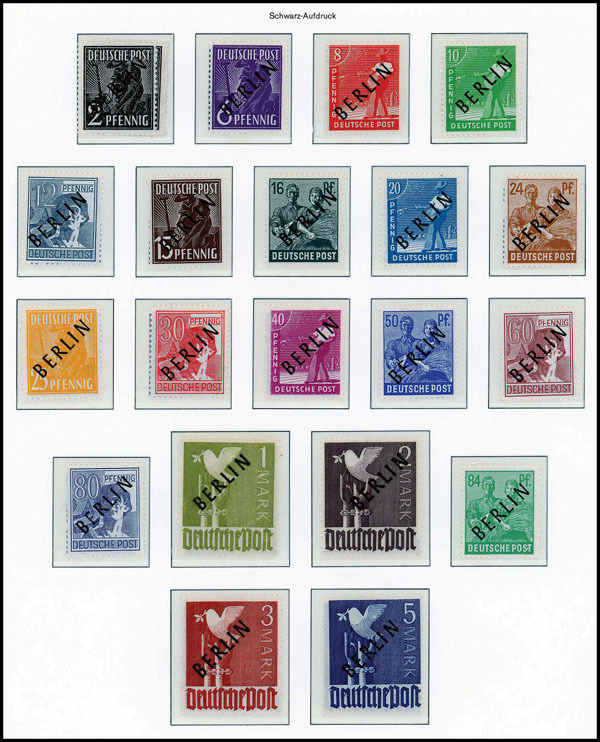 German Area, 1941 to 1998 With Berlin and D.D.R, hinged on Scott Specialty pages, mixed mint and used with more mint than used, incl. Semi-postals and Airmails, well filled, a few partially stuck down, Fine to Very Fine. German Area, Collections and Accumulation, in banker box, 3 albums, on pages, in glassines, mint and used, some States but mostly 20th Century, some identified by Michel # with old DM cat., some fly speck varieties, occasional better, generally Fine to Very Fine. German Area, Cover Stock, 187, majority 3rd Reich, but at least 20% earlier incl. few stampless, few later, mostly postcards (mixed mint and used), many military related, retail $3097, generally Fine to Very Fine. German Area, Three Volume Mint and Used Collection, Third Reich mostly mint in hingeless Lighthouse album, Federal Republic mint and used to 1997 on Minkus pages and comprehensive, mostly mint Berlin to 1990 in hingeless Kabe album, a useful group, generally Fine to Very Fine. German Area, Mint Colonies Collection, Few hundred o.g. including German New Guinea complete and few better Yacht issues in other colonies, generally Fine to Very Fine. German Area, Used Collection in Scott Album, Few thousand from 1868 to 1988, nice run of Empire and Third Reich issues, some better Semi-postals and post-war issues, few Danzig, Saar and Occupation issues, generally Fine to Very Fine. German Area, Used Selection, Mostly modern used commemoratives, Airs, and Semi-postals, about a thousand, on #102 cards in a red box, running from 1959 up until 2010, nothing expensive, but everything selected for centering and cancels, strong in better Berlin, better early Germany - Republic, Reich, Bundespost - on black stockcards, with stated values running to about $50 per card, dealer-priced in excess of $3,000, mostly different, a bargain for the dealer or the collector., generally Fine to Very Fine. German Area, Post-War Covers, About 400 with some better Semi-postal usages, majority commercial with some FDC's, Fine.